Situated next to Barcelona University’s Mundet Campus, this international student residence offers a gym, 24-hour reception and air-conditioned rooms with free WiFi. Mundet Metro Station is 500 metres away. Each bright room at Àgora BCN. Residencia Universitaria Internacional has simple décor. All rooms include a work desk, a mini fridge and a private bathroom; bed linen and towels are provided. You can enjoy a varied buffet breakfast in the Àgora’s dining room, and drinks and snacks are available from vending machines. There is also a multi-purpose sports pitch and a self-service laundry room on site, available at an extra cost. 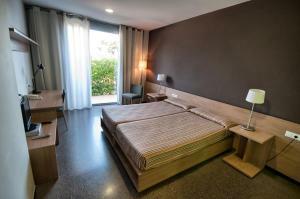 The Residencia is located next to the Olympic Velodrome and the beautiful landscaped gardens of the Labyrinth Park. Mundet Metro Station offers direct links to central Barcelona in around 15 minutes. Please note that the residence is open to the university community, including students, professors, researchers, administrative staff, etc, all year round. Please note that a document certifying the academic relationship is required at check-in. Guests are required to show a photo identification and credit card upon check-in. Please note that all Special Requests are subject to availability and additional charges may apply. This room has independent air-conditioning and heating and connections for satellite TV. 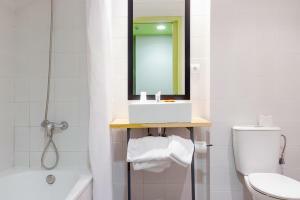 A daily cleaning service is available and bed linen and towels are provided. Some rooms have a balcony. 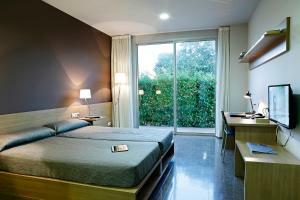 Rate: € 81.00 ... € 87.00; select dates below to get current rates.